Lebkuchen, or giant hearts (often with cheesy sayings in frosting), are commonly offered for sale at German carnivals. Sweethearts buy them for each other. I always wondered what happens to the Lebkuchen after the fair. Are they put on a shelf to be cherished forever? Do the owners risk their teeth and try to eat them? 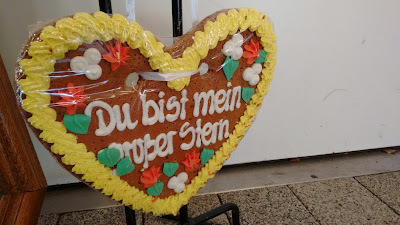 Or, do they end up in a flea market, like this poor, unloved Lebkuchen did? I then wondered: would anyone buy it and give it a second life? What would that person do with it? What kind of person buys used Lebkuchen? My Week: May 24 ed. My week: May 17 ed. My week: May 10 ed. I was featured in Multicoolty! My Week: May 3 ed.